Updated Monday November 5, 2018 by Tim Dodge. Description: Welcome to the Community Christmas Care webpage! In 2010, the ESP Rec-Council created this program, in cooperation with Edgemere and Chesapeake Terrace Elementary Schools, to support local families in need during the holiday season. In addition to various ESP Programs who have volunteered to Adopt families during the holiday season, this program is also open to organizations and individual families looking to share their Christmas Spirit with those in need. - Gift cards- and sometimes gift items for the parents themselves. The school guidance counselor also asks each family being adopted if it is okay to contact them directly. 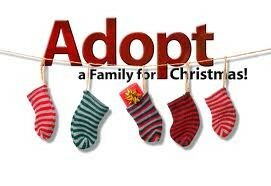 If so, upon contacting them, adopting families can deliver their wrapped gifts to them directly. Otherwise, they can drop them off at the school. Either way, YOU are making a HUGE difference in the lives of children! We are all in this together as a community... THANK YOU for your consideration! If you are interested in adopting a family or just want more information, contact the Program Chairperson.